The development of EQUIVert was initiated by Burkhard Heidemann from the Fraunhofer Institute for Microelectronic Circuits and Systems (IMS). Together with Dr Uso Walter from HNOnet NRW, he developed the idea for EQUIVert with the aim of making balance training even more efficient and of giving those affected and also senior citizens a tool to maintain their balance capacity. The first approaches for distinct functionalities were developed in cooperation with the Department of Electronic Components and Circuits (EBS) at the University of Duisburg-Essen. GED then took over the system integration of the various approaches into the first overall prototype and developed it further until it was ready for series production. GED had to go through the rigorous certification process for the development, production and distribution of electronic components and components for medical devices according to the German Medical Devices Act. 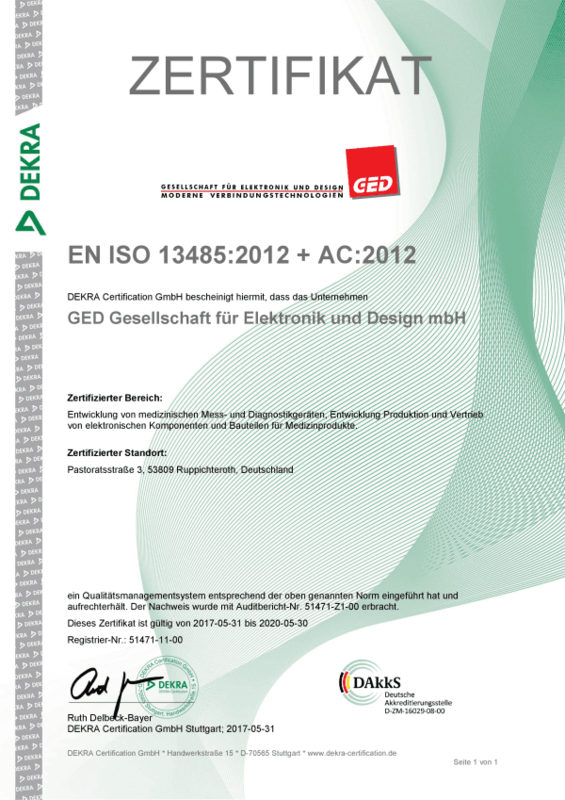 In February 2017 GED was granted the certificate according to EN ISO 13485:2012 by the examiners of DEKRA. The development was in part funded by the Federal Ministry for Economic Affairs and Energy within the framework of the Central Innovation Programme for SMEs (ZIM). GED Gesellschaft für Elektronik und Design mbH has been operating since 1986 as a service provider for electronics. The service portfolio includes consulting and development, CAD design and PCB layout as well as the production of electronic modules and devices. GED develops, tests and produces innovative electronic products for industrial electronics and medical technology. The use of state-of-the-art development tools for integrated m-CAD and e-CAD as well as simulation tools for static and dynamic simulation enables very short development times as well as cost-optimised series solutions. With its expertise in the areas of components and technology, sensor technology and microsystem technology, circuit design, mobile communication, system and application technology, Fraunhofer IMS is the only microelectronics institute in Germany that covers the full range of microelectronics. The research and development activities have resulted in numerous patented and published system concepts, procedures and implementations in the medical sector, some of which have been developed with industrial partners to market maturity. These experiences and competencies of IMS complement those of its partners in an optimal way and form an excellent basis for this project. The employees of the Department of Electronic Components and Circuits (EBS) of the University of Duisburg-Essen are, as numerous R&D projects of recent years impressively prove, proven experts in the fields of medical device technology and sensor technology, telemetry and system interaction as well as assembly and connection technology. Numerous patented and published system concepts and procedures, functional samples and system prototypes were developed in this context, many of which were developed to market maturity. In HNOnet NRW eG, approx. 420 established ENT specialists from the federal state of North Rhine-Westphalia have joined together to ensure high-quality specialist medical care in the future. HNOnet NRW eG sees itself as a modern medical service provider, which supports the work of established ENT specialists in all areas and permanently ensures the future of outpatient care in the ENT area. ZIM (Zentrales Innovationsprogramm Mittelstand) is a funding programme for small and medium-sized enterprises (SMEs) with business operations in Germany that want to develop new products, processes or technical services or significantly improve existing ones. The programme is open to all branches and technological sectors. The aim of ZIM is to sustainably increase the innovative capacity and competitiveness of SMEs, including craft businesses and independent professions. Thus the programme contributes to economic growth and the generation of new jobs.